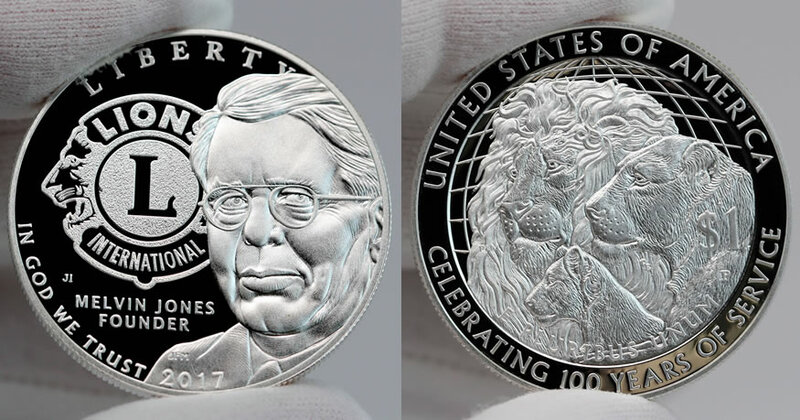 First-day sales are in for 2017 Lions Clubs International Centennial Silver Dollars, the pair of proof and uncirculated coins commemorating the 100th anniversary founding of the world’s largest service organization. Release on Wednesday, Jan. 18, the United States Mint reported that their first-day sales accumulated to 25,170 coins with splits of 19,244 for the proof version and 5,926 for the uncirculated edition. Totals through Sunday, Jan. 22, moved up to 23,349 for the proof and 7,107 for the uncirculated, bringing their combined sales to 30,456 coins. There’s no fear of them selling out — at least any time soon. Congress authorizes commemoratives and laws for them always outline very liberal quantities. In the case of the Lions Clubs coins, the U.S. Mint is allowed to sell up to 400,000 of them. Both dollars are available at introductory pricing until 3:00 p.m. ET on Feb. 21. Discounted now by $5 each, the proof is $47.95 and the uncirculated is $46.95. These prices include an extra charge. Surcharges in the amount of $10 for every silver dollar sold are authorized to be paid to the Lions Clubs International Foundation and its mission to support groups in more than 200 countries. The U.S. Mint’s product page for the silver dollars is right here. Place phone orders at 1-800-USA-MINT (872-6468). CoinNews will publish more photos of the two coins on Tuesday, Jan. 24. The Lions Clubs Foundation charity only gets the $10 surcharge per coin paid by US Mint customers (not tax-deductible) if the commemorative coin program makes a net profit. Otherwise the Mint keeps the surcharges. The US Mint could give you that answer to the penny if they weren’t so tight lipped about everything that goes on there. There are way too many variables in each commemorative coin program to tell what that magic # is for making a net profit (price of metal, labor, dies, packaging, advertising etc.). But, the Mint is required to publish the amount given to the charities, or not, after a reasonable period after the end if the year after they do a final audit of all sales & costs. Since 1982 when the modern commemorative coin programs began, the Mint has forwarded to charities listed in the program public law approximately $500 million in surcharges paid by Mint customers for such coins on the programs that made a net profit. Thanks. This hobby has a lot more to it. That is if I want to learn more about it which I do. When I first started years back I just wanted old silver coins. Now I also buy modern coins, medals and bullions. In other words I’m being smarter about what I buy and when I buy what. When the price of silver and gold are down I buy more bullions. When the price is up I buy more numismatic coins. Or I try to follow that formula. Sometimes it depends on the mint and when they put some items on sale. I know there is a lot more to learn and I’m excited about it. I’m glad you’re excited about this hobby. Every once in a while you’ll be able to buy a coin from the mint that will be worth so much more than one would think it should be in the long run. For example, the 1995 10th anniversary American eagle set which contained the first W mint silver eagle or the 1997 uncirculated $5 gold Jackie Robinson commemorative coin. Both of these coins ended up being worth significantly more because of their rarity and popularity. The 1995 W American Silver Eagle is “THE” coin to have for sure! I think the main reason the mintage was low on it was because it came in a set that had, I think, four gold coins which made it out of reach for some collectors to buy. Like they say: “If I would have known then what I know now” I would have even gotten a loan to get the set! At just about any rate! But I do think some collectors knew the ’95 Silver Eagle was going to pay off big time but just could not afford to buy the set. That’s another thing that makes this hobby fun and frustrating at the same time. Price was surely a factor (at $999 for the 4 gold, 1 silver set) and when I saw the set I probably just assumed that the silver eagle was a P mint which was being offered separately for only $23. Not a hard choice to make. But, like you said “if only I had known…”.